Superb Medical Care at our nursing home: "Saunders Medical Center Long Term Care." Long Term Care | Caring with Love for your Loved Ones. 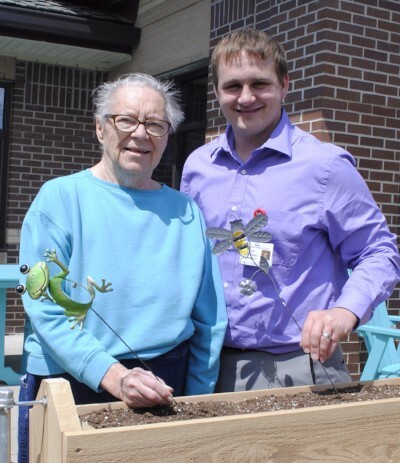 Sam Prokopec (right) with resident Helen Petersen. Her husband, Alfred made the planter for Memory Lane. Born and raised in Norfolk, Nebraska, Sam Prokopec attended Norfolk Catholic High School. Sam is the youngest of three boys and his parents have always been his biggest supporters. Originally interested in Physical Therapy, soon healthcare was his mission. His wife, Stephanie, is also originally from Norfolk, and now works at Saunders Medical Center in Registration. For fun they love taking their Australian Shepherd on walks. Personally, Sam loves to golf, be outdoors and to cheer on the Huskers and Chiefs. I love being able to make positive differences in the lives of residents, families and staff. I am very passionate about Long Term Care and helping our residents feel valued and at home. I am excited about the opportunity to relocate and make Wahoo home for my wife and I.
Stephanie Myrberg is with resident Charlie Johnson. Stephanie's hometown is Broken Bow, Nebraska. She is the Skilled and Long Term Care Director of Nursing. I love meeting all of our residents, families, and staff and taking time for those who I meet. Married for over 20 years to her husband, Tim, they have two children and a very spoiled mini golden doodle named Bailey. In her spare time, Stephanie enjoys being outside, taking long walks and visiting Okoboji! She relaxes each evening by journaling about her day. 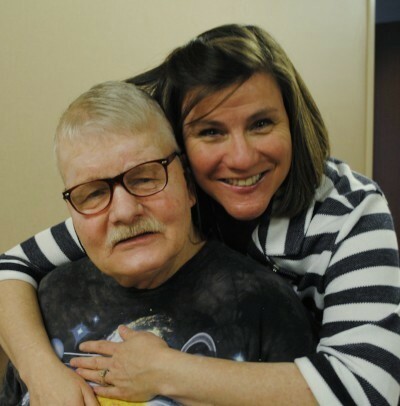 It is great to see a familiar face, especially when moving to a nursing home. We have nursing staff from all over and we look forward to providing you the best possible medical care! But more then that, personal care as if neighbors...or even family!